1) I lost or never received the OS Disks for my Mac and now I need to reinstall the OS. What OS can I use? 2) I want to upgrade my Mac, what is the latest OS version I can run? 3) My Mac came with OS X 10.2, how can I upgrade to 10.7 Lion? 4) I just bought a new Mac. Can I use the OS Disk to upgrade my old Mac? Rather than attempt to directly answer these and all the different variations of the above we see, I want to provide some basic background on the subject. 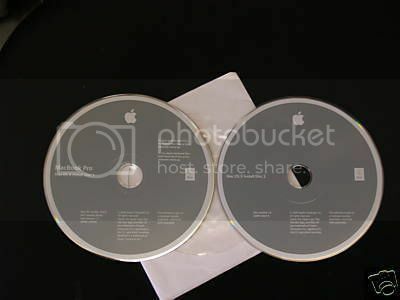 As the name implies, Machine Specific Disks (the gray to silver gray disks) will only install and run on the Mac model they originally shipped with. 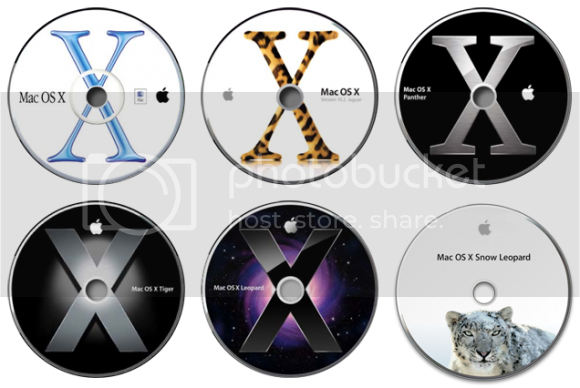 Retail Disks, on the other hand, will install and run on any Mac that meets the minimum system requirements. PLEASE DON'T WASTE YOUR TIME AND MONEY BUYING MACHINE SPECIFIC OS DISKS ON eBAY! They will almost certainly not work (unless you get extremely lucky). As you can see from the photo above, Retail Disks (and their boxes) are either Black or White, not Gray. I may add more to this post later, if warranted. Hopefully this will help. This is great information for newbies and very clearly laid out. I could have used this chart a couple months ago. Thanks! Razormac...you must have had some spare time today!!! Great job...I especially like the photos of all the OS install disks! p.s. The tough part is getting folks asking the questions to read these threads first! But certainly a GREAT thread to direct folks to. Well done. A fine post highlighting the differences between machine specific and retail discs. Important Links: Community Guidelines : Use the reputation system if you've been helped. Thanks! I appreciate the comments. And, yes, Nick. I did have some free time on my hands. And it's not "pinned" yet, because... ? +1 rep and it is a must to be pinned! Somebody pin this incredibly useful thread!! Great job. Your post should avoid a lot of head scratching. Keep up the good work. Funny I missed this thread! VERY good job Razor! Very helpful. i'll give it a whirl. Apple say the no longer stock the leopard 10.5 and said to get it from a third party stokist any idea where i can purchase it cheaply...as its still expensive on amazon? "Mac OS X can't repair disk" and "Disk not ejected properly"
Can I repair disk by holding "Option" instead of "C"
Recommendations for "Defragging", or "Speed Disk"